into a dramatic oceanic backdrop for this highly competitive test of team endurance. A destination for outrigger athletes from around the world, this year’s event will feature Team Primo, the all-star Hawaii team of champions who have broken boundaries in water sports and are regarded by many as the ultimate competitors in ocean racing. Event festivities will be held at Brooklyn Bridge Park with additional spectator viewing stations at Piers 25 and 66 in Hudson River Park. The premier event of New York Outrigger, the Hawaiian Airlines Liberty Challenge is one of the most prestigious long-distance outrigger canoe races in the world, drawing over 300 world-class international athletes for the chance to compete in the bustling New York City Harbor in front of thousands of spectators. Teams not only have to gauge the strong tidal currents with their dramatic and sudden shifts, but they must also negotiate the vast number of ferries, cruise ships, tour boats, barges, tankers and pleasure craft that fill New York Harbor, the East River and the Hudson River. Men, women, and co-ed crews race along a challenging and visually-stunning course, which includes recognized landmarks and National Parks sites including the Statue of Liberty, Ellis Island and Governors Island. 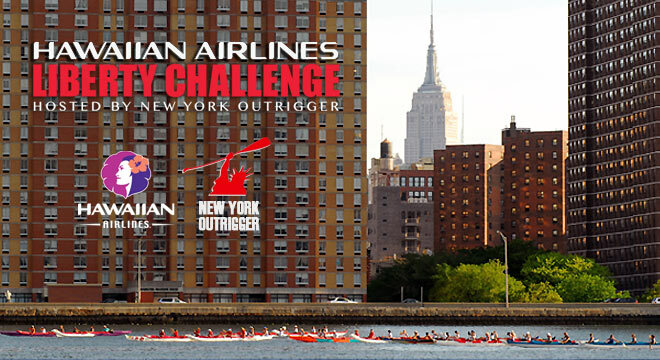 The multi-year sponsorship agreement includes renaming the event known previously as Liberty World Outrigger Competition as the Hawaiian Airlines Liberty Challenge, hosted by New York Outrigger, as well as providing support to underwrite the costs of running and promoting the event. The event is run in three 11 to 15-mile heats, with the 15-mile women’s competition beginning at 7:30 a.m. ET, the 15-mile men’s competition beginning at 11:00 a.m. ET, and the 11-mile co-ed competition beginning at 2:30 p.m. ET. All heats begin on the East River under the Manhattan Bridge and finish at Brooklyn Bridge Park. Updates on the event are available online. Please look for continued Hawaiian Airlines Liberty Challenge announcements at LibertyOutrigger.org, or follow updates on Twitter (@NYOliberty), (#libertychallenge). Become a fan on Facebook at facebook.com/LibertyChallenge. Based in Hudson River Park in New York City, New York Outrigger (NYO) is dedicated to inspiring paddlers and providing New Yorkers with a unique opportunity to experience the city through its waterways. As a volunteer-driven, 501(c)(3) non-profit we strive to educate New Yorkers about outrigger canoe paddling and its roots in Polynesian culture through participation in our races, instruction, and educational initiatives. The Hawaiian Airlines Liberty Challenge, NYO’s premier event, is one of the most prestigious outrigger canoe races in the world. NYO is a member of the East Coast Outrigger Canoe Racing Association and is the 2011 champion of the ECORA point-series. For more information, visit NewYorkOutrigger.org. Follow updates on Twitter (@NYOutrigger) and become a fan on its Facebook page (newyorkoutrigger). Hawaiian has led all U.S. carriers in on-time performance for each of the past eight years (2004-2011) as reported by the U.S. Department of Transportation. In addition, consumer surveys by Condé Nast Traveler, Travel + Leisure, and Zagat have all ranked Hawaiian the top domestic airline offering flights to Hawaii. Hawaiian was also the nation’s highest-ranked carrier for service quality and performance in the prestigious Airline Quality Rating (AQR) study for 2008 and 2009. Now in its 83rd year of continuous service in Hawaii, Hawaiian is the largest provider of passenger air service to Hawaii from the state’s primary visitor markets on the U.S. mainland. Hawaiian offers nonstop service to Hawaii from more U.S. gateway cities than any other airline (total of 11, including daily service from New York City’s John F. Kennedy International Airport), as well as service between Hawaii and Japan, South Korea, the Philippines, Australia, American Samoa, and Tahiti. Hawaiian also provides approximately 170 daily jet flights between the Hawaiian Islands. Hawaiian Airlines, Inc. is a subsidiary of Hawaiian Holdings, Inc. (NASDAQ: HA). Additional information is available at HawaiianAirlines.com. Follow updates on Twitter about Hawaiian (@HawaiianAir) and its special fare offers (@HawaiianFares), and become a fan on its Facebook page (Hawaiian Airlines).